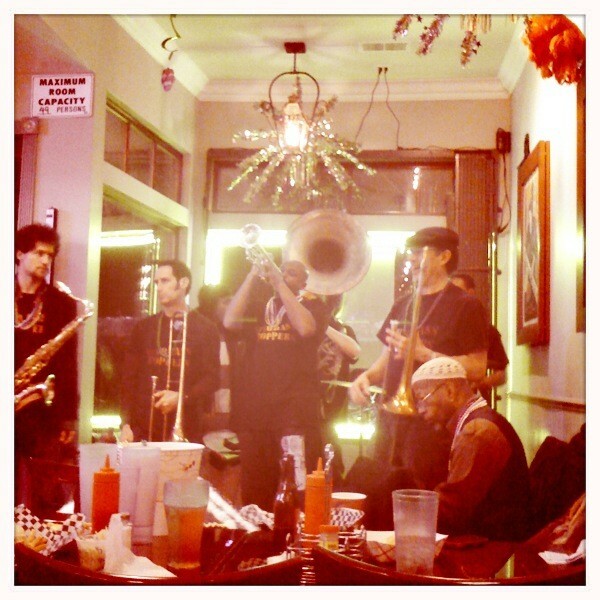 MJ's Brass Boppers, tearing it up at Queen's Louisiana Po-Boy Café to mark Lundi Gras. A little rain didn't stop moneymakers from being shaken at Monday night's Lundi Gras celebration at Queen's Louisiana Po-Boy Café. With as many band members as there were tables, the festively raucous MJ's Brass Boppers tore up the little café in honor of the less-known little brother of Mardi Gras. Of course, the celebration wouldn't have been complete without a feast, and on top of Queens' storied po-boys, there were specials on fried chicken and jambalaya and free king cake for all. Sadly, SFoodie was too stuffed to dance.